Slackware articles through the ages. I do not think it is a good idea to include qoutes when posting article links in these threads. If folks are interested in the subjects then they will click the link and read the article. Also I am not a fan of teasers and trailers, where is the mystery in that. Dive and and live the experience. however this is just too good a piece of history to not show. By January 1994, Slackware had achieved such widespread use that it earned a popular notoriety normally reserved for rock stars and cult leaders. Gossip spread through the Usenet suggesting that the entire Slackware project was the work of witches and devil-worshippers! "Linux, the free OS....except for your SOUL! MOUHAHAHAHA!" Edited by abarbarian, 19 November 2013 - 08:06 AM. With your recent gremlin attack Eric I thought this might be of use if you wanted to run Slackware on an old pc you may have in your museum. I do not think it is a good idea to include qoutes when posting article links in these threads. If folks are interested in the subjects then they will click the link and read the article. On the contrary, I much prefer to see a couple of lines quoted that give me the idea of the meat of the article. If it interests me, I will follow the link to get the peas and potatoes. I rarely click on mystery links. Nothing mysterious about my links posted here ! Oh wait , darn I forgot they were about Slackware an thats pretty mysterious. That article brought back memories of things I haven't had to think about in years. Glad you found the thread of some use. The Microlinux Enterprise Desktop is a full-blown production desktop based on the latest stable Slackware Linux release, starting with 14.0. It is currently used by various small town halls, public libraries, schools and local radio stations in South France. The Microlinux Enterprise Desktop runs reasonably fast on ten-year-old hardware. A battered first-generation Pentium-IV with 512 MB RAM and a 10 GB hard disk will be sufficient for the job, though users of the KDE edition will prefer to add a little extra memory. Nicolas Kovacs of Microlinux is a friend from LinuxQuestions.org and a co-creator (along with Eric Hameleers) of the Slackware Documentation Project, of which I'm a editor. Oddly enough, I've recently re-discovered how simple this is to do in Xfce4 compared to KDE4. It's just a setting in the Settings Manager under the Mouse and Touchpad category. That's a pretty decent blog you linked to there, abarbarian. Who is that Nocturnal Slacker guy and why doesn't he write more articles on that blog? Who is that Nocturnal Slacker guy and why doesn't he write more articles on that blog? Answer could be in his name perhaps. Mind you someone told me he was an old space cadet so maybe he spends a lot of time out on Mir. P.S. Could you include a (2011) in your article link. Ta. With Slackware articles still a bit thin on the ground here is a good read. It is a freed download of the book. Edited by abarbarian, 21 March 2014 - 09:18 AM. Interesting to see how a variant develops over time. I did come across one or two articles about the 14.04 release but I did not like their tone so will not post a link or support them. One of the articles was very scathing about the development of the os which to my mind was pretty crass and lacking in empathy for a fellow human. Obviously this reviewer did not even take the time to check out the os's home site. Where the second newest post on the News page states that the developer has been ill for some long time and is only starting to gain better health. Also on the main site for the os it states that this os is developed specifically to run on older hardware so does not have all the bells and whistles of a modern variant, neither of the two articles even gave this a passing mention in their negative reviews. Many myths about Arch/Slackware and I should say also Gentoo aren’t true. 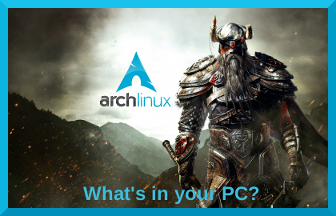 Both, Arch and Slackware, bring only the best to the operating system experience. BSD elegance and Linux kernel. Great customization, great user experience and unique philosophy. Today quality and simplicity don’t go together. But let’s take a look at some of the main aspects of a GNU/linux Distribution. But every challenge need to have a winner an the winner here is the user himself. No matter what you choose you will win and learn a lot of thing about GNU/linux, much more of what you could learn with an “easier” distribution. Ah so true. Where did I go wrong. Why do you think you went wrong? My biggest regret regarding GNU/Linux was that I didn't start back in 2000 when that friend of mine gave me those nine floppy disks with Mandrake Linux on them. Slackware Current Update - FAIL!